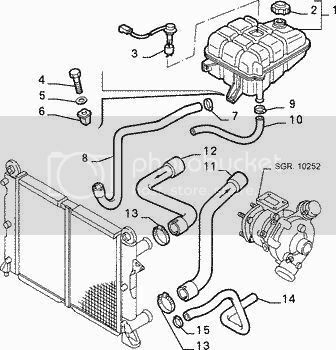 I'm looking for a complete Samco hose kit for my Q4, and also a place to buy it. 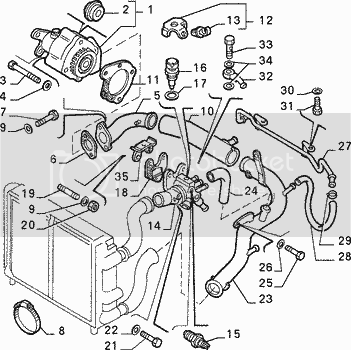 I would like kits to both Turbo and Coolant. Anybody know where to get such? Or which kit for the Delta Integrale that will fit? What do you suggest to do then? Or should I just keep the original? Ik think you should customize your own. At least, that is what i willl do when hoses are gone and needs replacement. Most hoses aren't available anymore or will get the status very soon. Well, I guess that is what I have to do then.. But...I think some will have to be specially made, when I have time I plan to take the water reservoir pipe and water pipe from under the inlet plenum, to a silicon pipe maker! Which one do you mean...number 10 in the first picture? Number 8 in this picture caused some problems, had to fabricate some metal elbows! But would really like to replace with silicon, it fastens to number 10 above. yes #10 ,first pic, the one Bielstein delivers is silicone made with the small conector made of solid aluminium, fits quite well , but a mess to change it with engine in the vehihle, I removed the throttelbody to get access to the hose. The punto hose had a separate connector, where you could mount a hose on each side. Worked (and still works) quite well, and the connector won't be an issue, only the hoses.. Interesting...I made my own (see pics - host not available!) but would rather have a proper part! Groan...now I need number 24 as mine is split! I think a standard Samco 16mmx102mm 90deg elbow (cut down) will do the job...just need to check the size (edit: steel pipe is 16mm). I split three hoses trying to get the 'stat off!!! Thankfully only this one is a preformed part. Last edited by wrinx; 09-02-08 at 17:59.